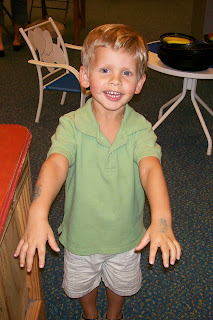 Each time we sign in at the children's museum they stamp our hands, something Dawson always looks forward to. The last time we went to the museum they had 6 different stamps sitting out. Dawson took it upon himself to stamp his hands and arms as well as both of my hands. Here, he's showing off his stamps.